The powerful monologue Robin Williams recited in Dead Poets Society is also part of his legacy in advertising, as it became the voiceover for one of the actor’s last spots in a line of commercials dating back to 1977. Williams, who died Monday at the age of 63, gained attention as an alien in the comedy series Mork & Mindy—a spinoff of Happy Days—in the late '70s and early '80s. The Oscar-winning actor-comedian is known for such films as Good Morning, Vietnam; Good Will Hunting; Mrs. Doubtfire; and Aladdin. Williams was also equally prolific in the advertising arena. His ads spanned decades from the Illinois Bell Telephone Company spot in 1977 in which he tested rotary and push-button phones as a retail store customer, using his trademark voice impressions, to his most recent ads for Apple iPad Air and Snickers. 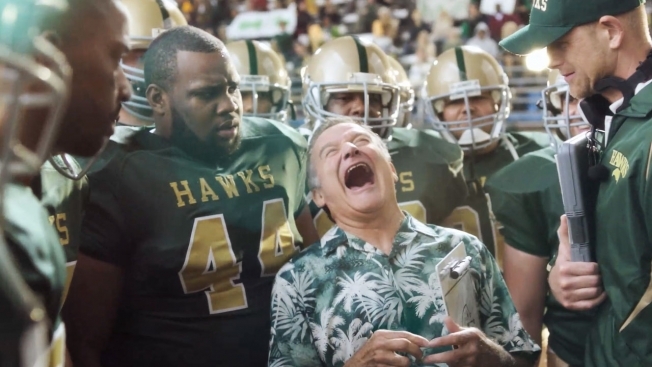 In his recent Snickers spot, Williams plays the main character, a coach who isn’t acting like himself until he has his candy bar. The spot was a callback to the frenetic improv style that made Williams a household name in the 1980s. One campaign that's both touching and sad to revisit is Williams' Celebrate Humanity campaign for the 2000 Olympics. "To be a giant. This has forever been our passion," he narrates in one spot. "Giants rise above fear, triumph over pain, push themselves and inspire others. To be a giant. To do giant things. To take giant steps. To move the world forward." Perhaps one of Williams' most emotional ads to look back on, though, is his 2011 spot for Nintendo's newest installment in the Legend of Zelda series. The ad highlighted the fact Williams named his daughter, Zelda Rae Williams, after the game series' eponymous character. "You're both," he tells her, "so magical."